For 25 years, Jetty's waterfront restaurant has been one of South Florida's most popular restaurant. 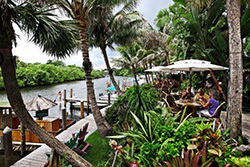 Jetty's offers unsurpassed views of the Jupiter Inlet Waterway and historic Jupiter Lighthouse. Signature menu items include freshly prepared fish, shellfish, certified Angus steaks, and ribs. A favorite of tourists and locals alike, Jetty’s offers a true Florida waterfront dining experience. 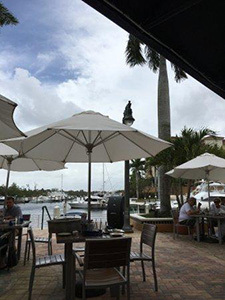 Next door to Jetty’s, U Tiki Beach is a fun, lively restaurant bar, and marina with a coastal view of the historic Jupiter Lighthouse. The menu boasts an array of fresh seafood, flatbreads, and sushi. And the views are breathtaking, and the boat slips, plentiful. Whether you arrive by boat or car, U Tiki Beach is a tropical getaway in your own backyard! Guanabanas has grown to become a favorite among Jupiter locals for three reasons: The lush, tropical setting; great cuisine and cocktails, and live music. Guanabanas is a completely open-air restaurant and bar with woven tiki huts and banyan trees towering overhead, and hand-chiseled coquina stone pathways underfoot. Menu offerings include shrimp tacos, macadamia coconut fresh catch, ribs, burgers, and more. This stunning restaurant and dining club offers a full bar, patio bar, and main dining room featuring rich wooden accents and an open kitchen. Guests enjoy palate-pleasing dishes with a modern twist like “street corn” Caesar salad, USDA Prime steaks, grouper with squash confit and strawberry sauce, truffle salt fries, and more. And, the view is pretty spectacular, too. Nothing like your typical “dive bar,” Dive Bar is where you submerge yourself in everything that’s South Florida... a raw bar (or steamed if you prefer), sushi and sashimi, delicious and affordable lunch and dinner entrees, an open-air bar area surrounding a giant saltwater aquarium, wide screens showing underwater videos, a large, al fresco patio dining area overlooking the water and designated docks where you can join us by boat. Check it out and dive in! A “polished casual” restaurant offering classic Italian food amongst the shadows of Roman ruins. 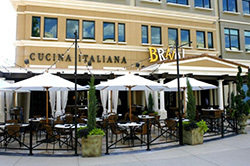 Enjoy favorites like linguini with clam sauce, eggplant parmesan, and wood-fired pizzas. Enjoy Mexico’s distinct flavors and beautiful culture at Calaveras Cantina. Margaritas, chilled beer, and all of your favorite authentic Mexican dishes are on the menu. Enjoy a sophisticated dining experience in a relaxed, comfortable environment. TWJ offers indoor and outdoor seating with plenty of opportunities to catch your favorite sporting events on one of the dozens of flat-screened TVs. Too Bizarre is a Jupiter among locals. Serving a delicious and eclectic Asian infusion menu, along with an impressive wine list, Too Bizarre is the perfect place for date night, a gathering of friends, or a special celebration. As you can see, Jupiter offers many opportunities to dine on the water. If you have any questions about South Florida real estate or the area, call Tauber Real Estate Services at 561-626-4633.